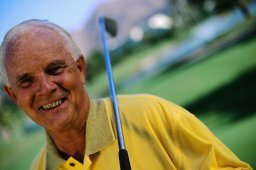 Golf fitness for seniors can be a good way for older adults to enjoy being active especially in their retirement years. Over 4 million people play golf 25 times or more each year. Playing golf is a good way to get outside and get some exercise and have fun at the same time. You don't have to be a Tiger Woods to enjoy playing. In its basic form, it is played in match play where 2 players or 2 teams play separate contests against each other. The team that wins the most holes wins. Another form is Stroke play where the score achieved is added for every hole. The player with the lowest score wins. The main difference between the recreational and professional sport is the fact that there is a handicap system for amateurs. This system is based on the skill level of the individual golfer. Golf is a sport that can be recreational fun. If you're looking for a way to socialize and be active try golf fitness for seniors. Check out Lady Golf Clubs and Equipment here. Check out golf fitness tips here.